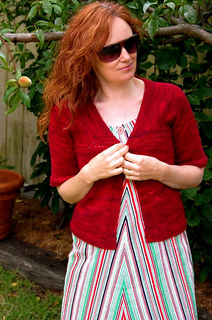 Miss Jane is the grown up version of Jane, a supersweet and simple knit for the junior set. Miss Jane transforms just as simply and suitably to the adult garment. It’s perfect for slipping over sundresses and frolicking in the Spring sunshine. Miss Jane has a simple yet unusual construction. I would describe it as a raglan hybrid. Yet, it is super simple to knit and is very sparing on yarn! 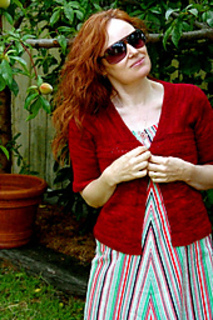 Miss Jane can be worn as an open cardigan or the eyelet details can be threaded with ribbon to close the cardie. Either way it is simple and beautiful. A staple garment for any wardrobe. This is a seamless garment, sparing on yardage. 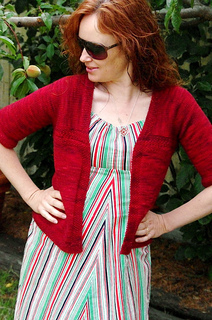 The body is knit flat, and the sleeves in the round. Sizing is based on upper chest measurement. 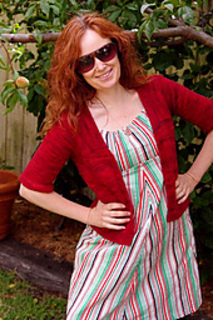 Yardage is approximate and will vary with different yarns and individual knitters.